Rock Fabrication is a stone fabricator providing a range of quartz, granite and marble for kitchen countertops, bathrooms, fireplaces, furniture, outsides of buildings, staircases and much more. We have been trading in Kent for over 25 years, using the latest technology to ensure precision finishes to all our work. We are proud to be a stockist of a wide range of natural stone and stone products, which allows us to cater for all budgets and fit a wide variety of quality products. At Rock Fabrications, we are committed to providing our clients with fantastic customer service. Which is why we are proud members of Checkatrade. 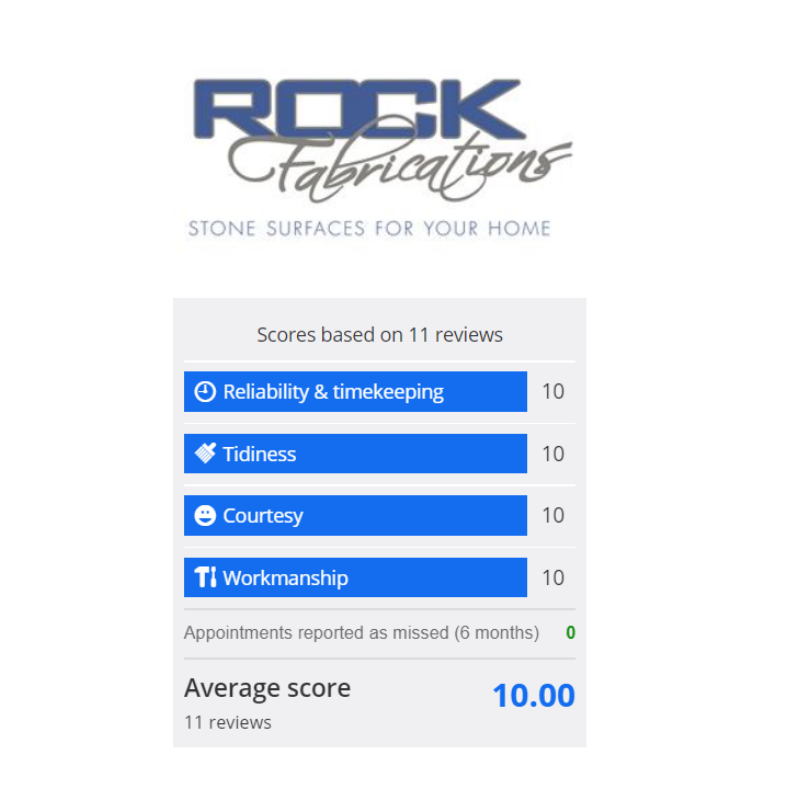 All reviews on Checkatrade are verified testimonials and we are very proud to have received top marks across the board for our stone fabrication work across, Kent, London and the South East. We are so proud to share these testimonials. A customer from Minster, Kent. New Beautiful Marble worktop at short notice to be shipped abroad. A customer from Rochester, Kent. A customer from Gillingham, Kent. A Customer from Maidstone, Kent. A customer in Sittingbourne, Kent. A customer from Chatham, Kent. A customer from Sittingbourne, Kent. A customer from Bexley, South East London. Measured, made and fitted new quartz worktop. A customer from Sittingbourne Kent. If you would like to see how Rock Fabrications could help you natural stone fabrication for your kitchen, bathroom, BBQ area or anywhere in your home and office, we can help you in three easy steps. 1) Visit our showroom in Gillingham, Kent or call us to get a quote. 2) We will measure up and create templates for your requirements. 3) Once everything is decided, we can install within 7 days. Find which natural stone is right for you.